Hey there! I know it's a winter layout, but you know I LOVE winter. It's time for the Therm O Web and Gina K Designs Winter StampnFoil release and you are going to love it! 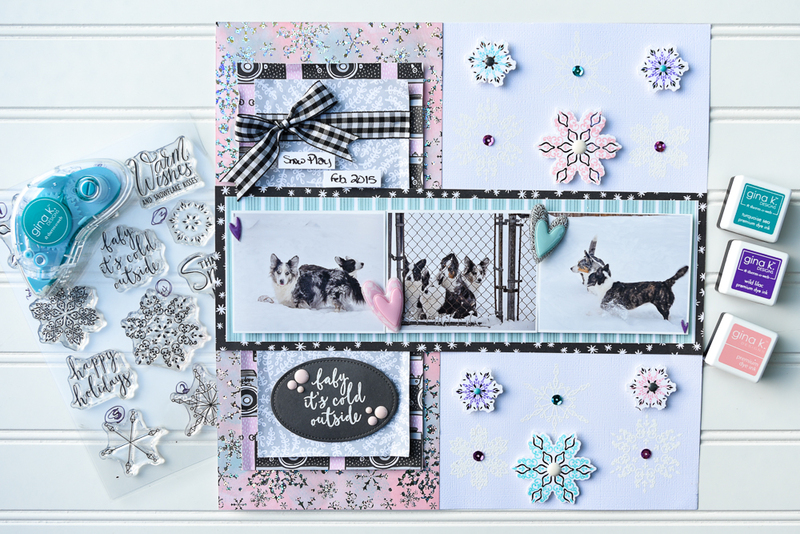 There are two different stamp sets, Baby It's Cold Outside and Holly Jolly. 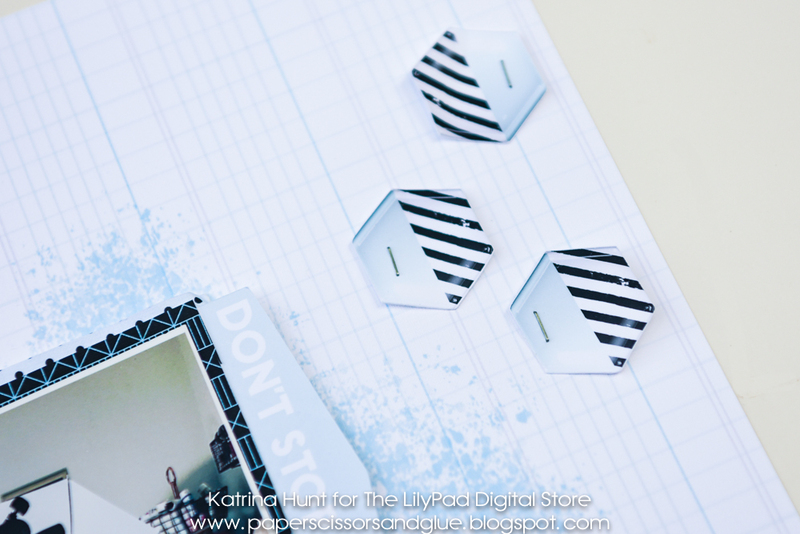 These have matching dies and then also matching Foilmates to go along with them. And you see that tape runner. 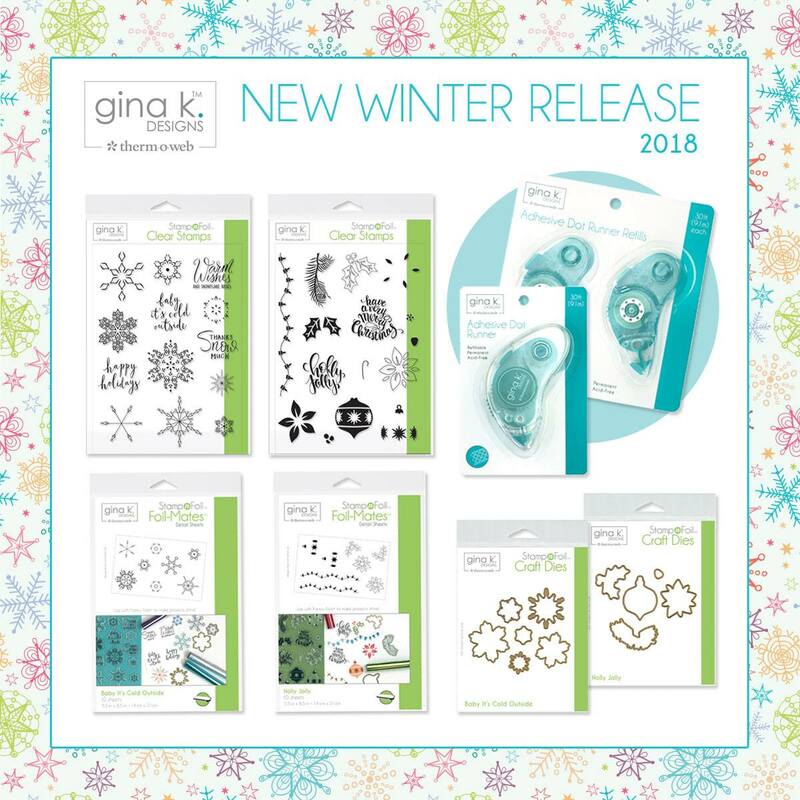 Yep, there is a Gina K Designs Tape runner release and I am kind of in love with it. Plus it's refillable, so YAY for the environment! 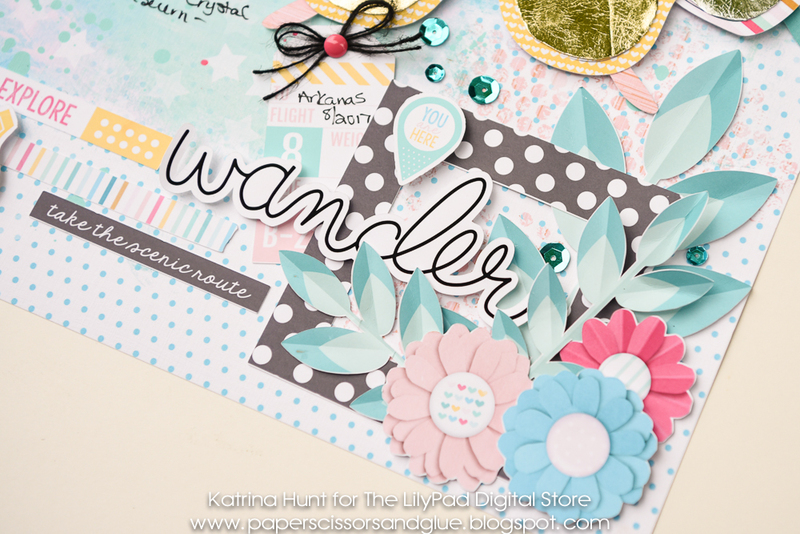 We are doing a blog hop for the release and I am the sixth stop on the hop. Don't worry, if you started here I have the full hop list below! 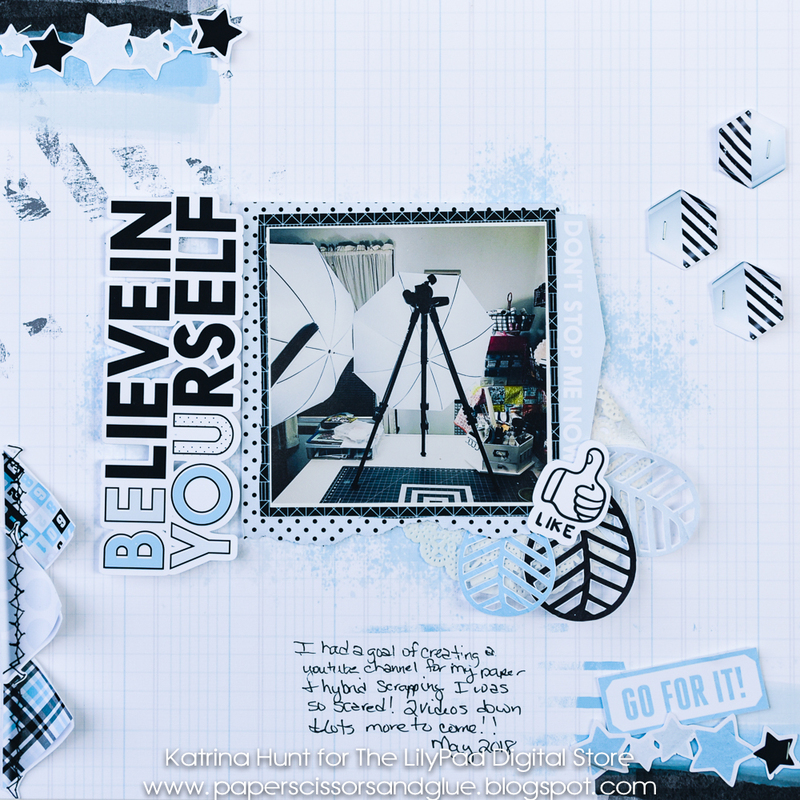 And because I am weird and different, I had to do a layout with those fun snowflakes. And of course, make them non traditional colors! And you are going to want to hop and comment, because PRIZES! 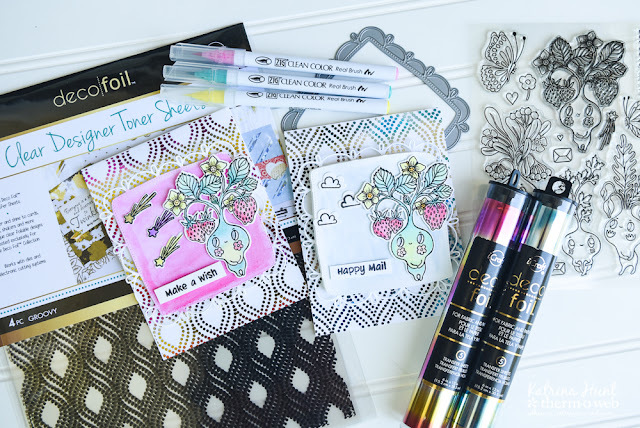 Supplies: Cardstock, Pattern Paper, Puffy Hearts-American Crafts; Stamps, Foilmates, Ribbon, Adhesive, Foil, Dies-Gina K Designs and Therm O Web; Embossing Powder-Hero Arts; Ink-Versamark and Gina K Designs; Sequins-WeRMemory Keepers; Enamel Dots-My Minds Eye. 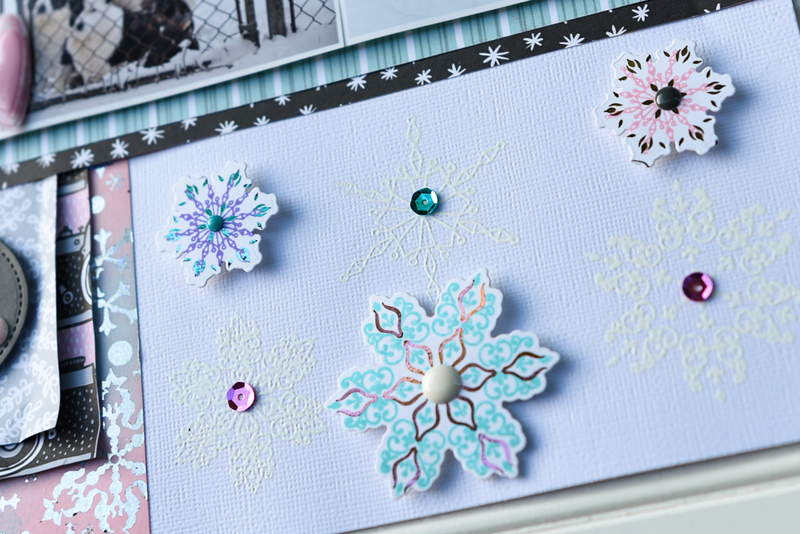 I thought those snowflakes would be fun to heat emboss on my background, just a tone on tone look and then pop up the foil/stamped/diecut snowflakes for fun! 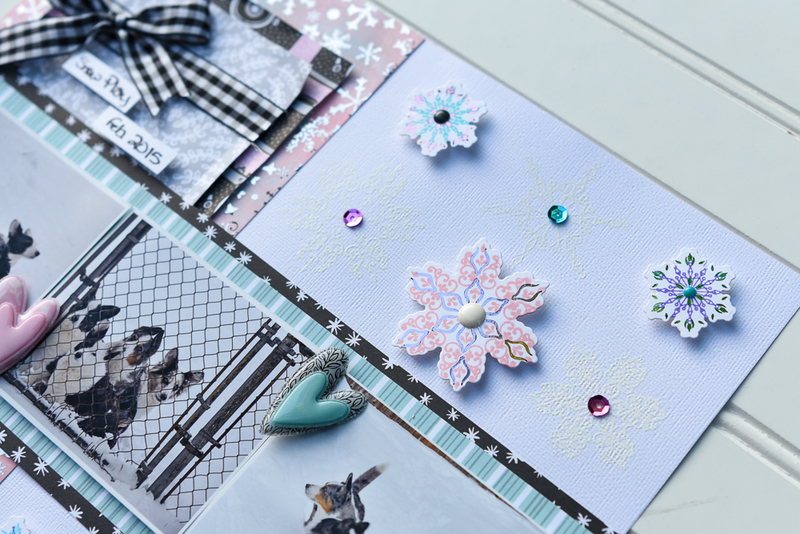 And every scrapbook page (well almost every!) needs a title and the "baby it's cold outside" stamp was a great title for this page. I die cut an oval out of some Slate Gina K cardstock and then stamped and embossed the stamp on the die cut. I added some enamel dots for fun! 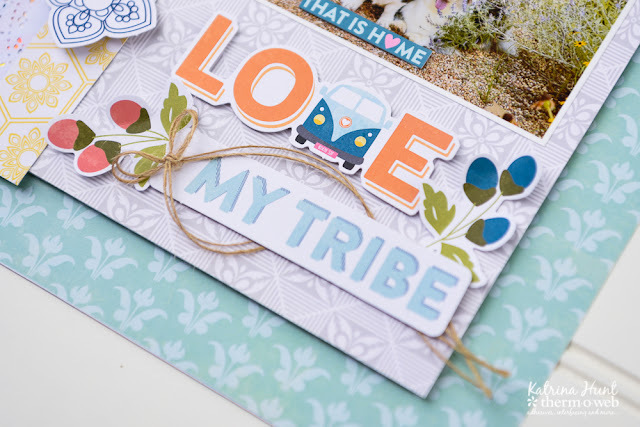 So be sure to leave a comment here, because they are picking some winners from the blog hop blogs and then there will be giveaways on Facebook, Instagram and Youtube. Be sure to "follow and like" to be able to win! Now, I bet you want to see the all the new products right? And this is a LIMITED RELEASE! So you are going to want to grab these if you don't win! Now, a list for the hop will help your chance to win tremendously I think!!! Also Gina K Designs will be having there own party and you can find that HERE. Alright, don't forget to leave a comment for a chance to win!!! 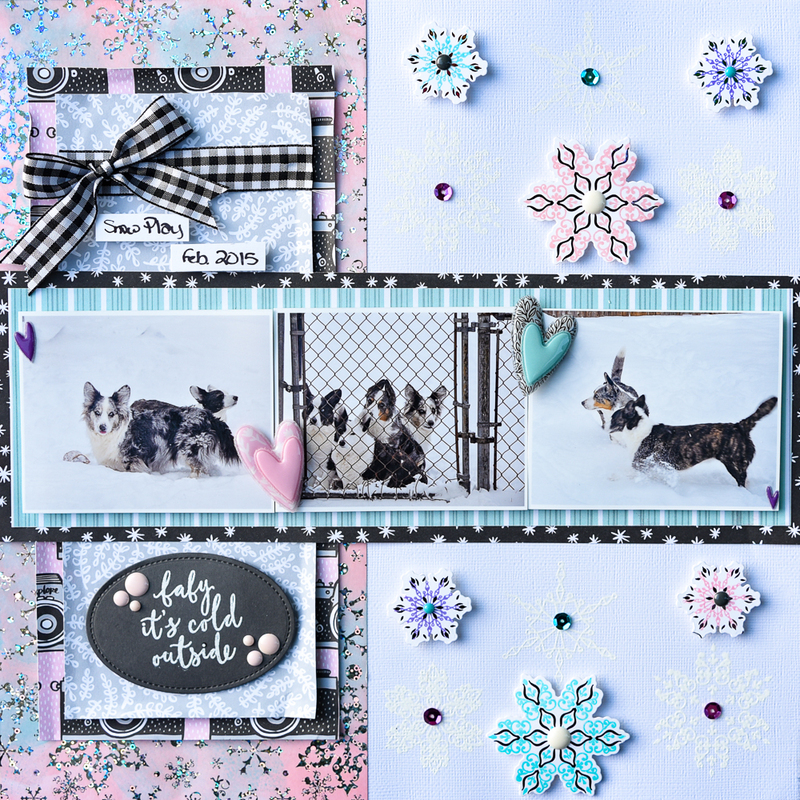 One blog comment winner (from all the blogs in the hop) will win the set I used "Baby It's Cold Outside, with additional goodies!!! And there is a Mega Giveaway on the Therm O Web Blog, it's pictured below!!! So make sure and comment there also!!! Thanks for stopping by today! Hope you have a wonderful week full of fun, laughter and crafting! Hey there! 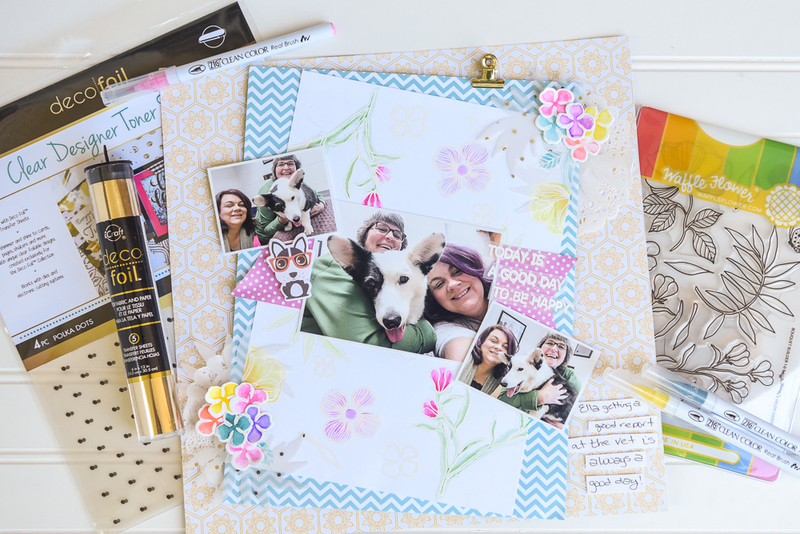 I am excited to share with you today that I am participating in Audrey Yeager's Summer Scrapping Series on YouTube. It's been a week a month summer series of videos encouraging people to scrap those summer photos! You can find Audrey's channel HERE. 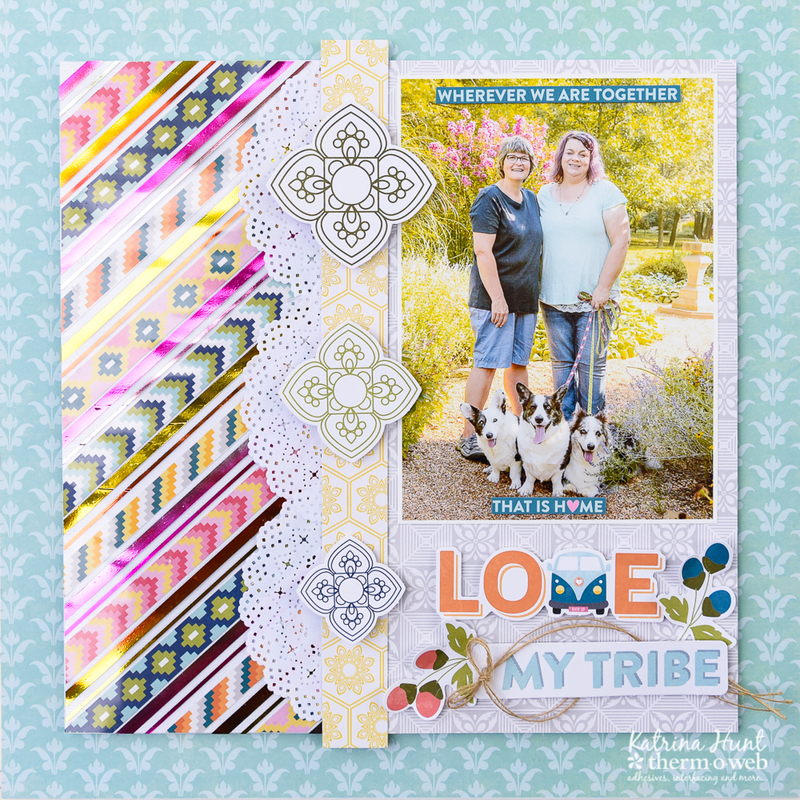 And Cheryl from FiddleDeeDee Designs and I used the same digital template and you can find her channel HERE. 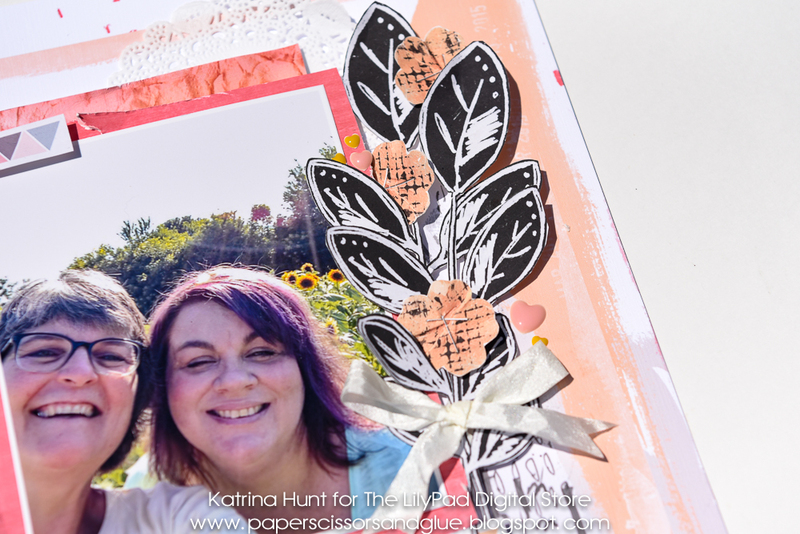 I did this hybrid layout, along with a video showing some of my hybrid process (or a lot, depending on how you look at it!). 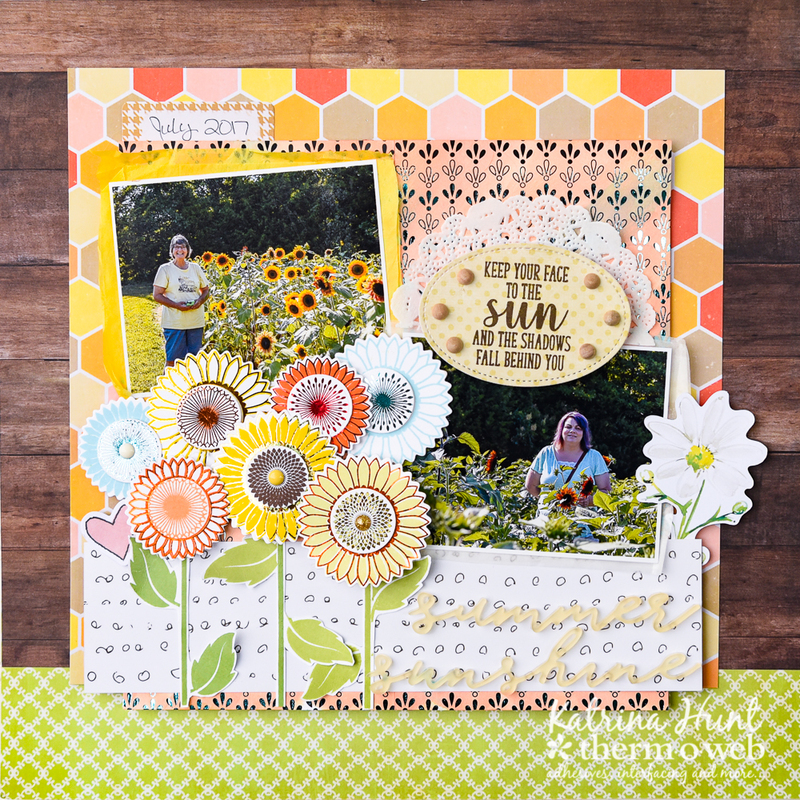 I also used a digital kit from Becca Bonneville. The video is at the bottom of this video! I would love it if you wanted to head over to YouTube and subscribe!! I think this corner is one of my favorite parts of the entire layout. Actually each section is, but hey a girl can have choices right?!! There is a funny story about these sunglasses. 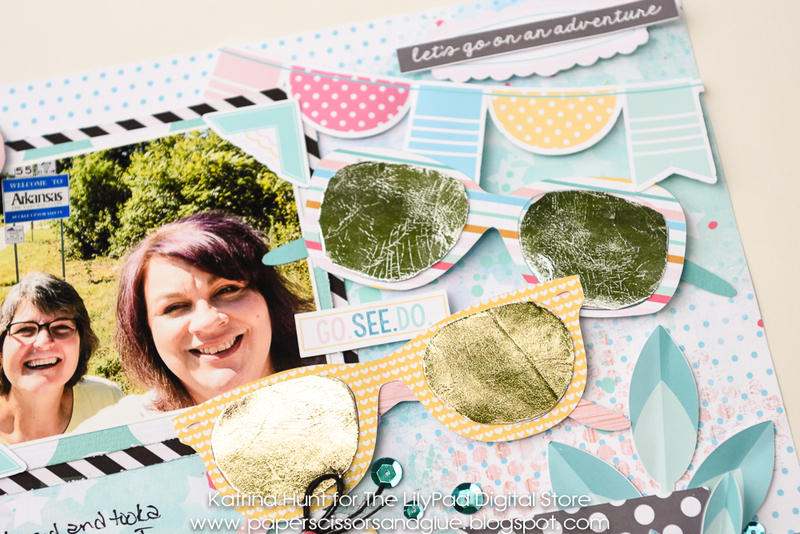 I hadn't told anyone or shown Audrey my layout yet and she posted a layout today where she used DecoFoil on sunglasses! LOL Great minds! And trust me, if you take me on a trip for directions you are going to take a scenic route and probably NOT on purpose! So, I had to use that phrase strip. And here is the video! Be sure to tell me what you like or would want to see and I will see what I can do! Hey there! I am back today, amazing right? I swear, just when I think I have gotten all of it together, then I don't. And it's not that I am ok with that, but that's just the way things are happening and I am just rolling with it. I have a hybrid layout to share with you today. The Lilypad has added some new designers to the store and let me tell you, their stuff ROCKS! Like makes me want to scrap all the time rock! I used Rachel Jefferies collection Wake Up and Be Awesome for this layout today. 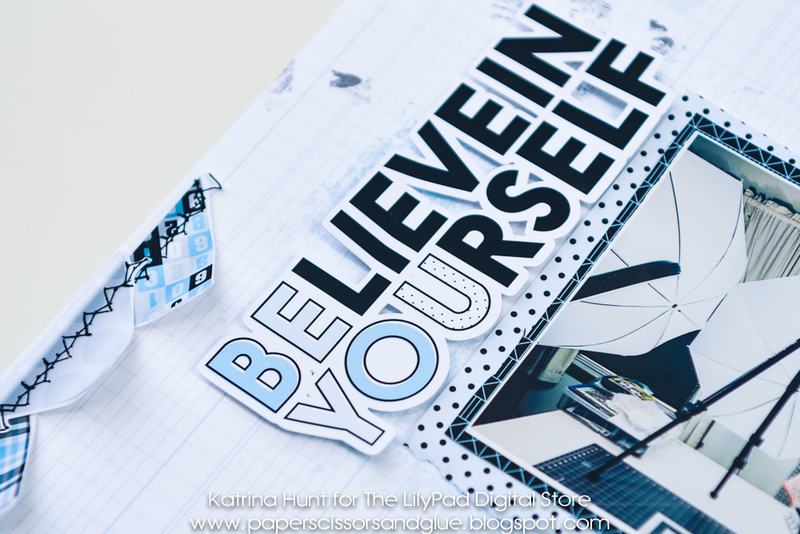 AND for this layout, I did not use my Silhouette to print and cut. I cut those elements out by hand baby! If you choose the right elements, then you can easily do this. I just printed everything out of Photoshop and went to work. SO, there is NO reason for you NOT to do hybrid! Now...one of the things I LOVE about hybrid is the fact that I can do "artsy" things to my papers and if I mess up, I just hit delete and redo it before I print anything! I know, I know total cheat method, but I don't do the artsy enough to be ok with the "where ever it falls" idea! And I LOVE the black in the collection with all the other colors. Those black leaves are actually what drew me to the collection and working with it. 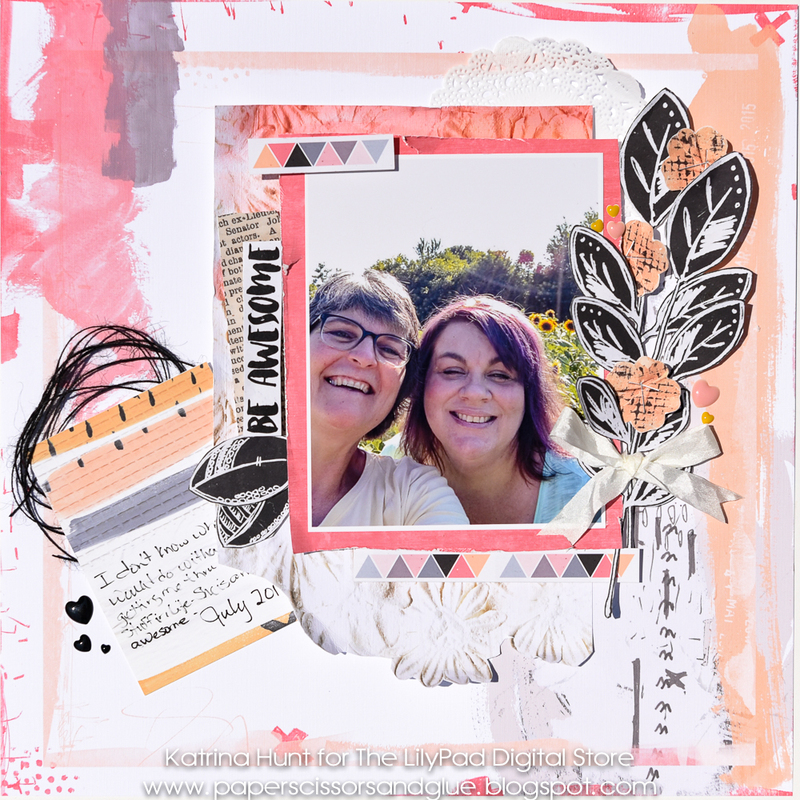 I could see me using this kit over and over, because what I used on my page is a fraction of what was in the kit! I loved the font the "be awesome" was in so it had to go on my page! 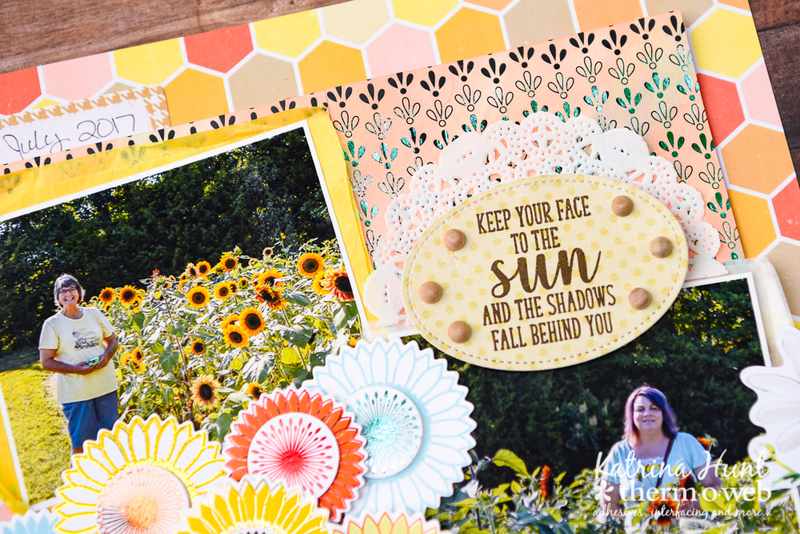 And if the picture on the layout looks familiar, it was taken along with those other sunflower pics! I can tell in this picture that I was having fun, but my momma was on my mind. These were in July of last year, so I was working thru some things. Who am I kidding, I am STILL working thru things. Losing a parent changes you, and when your parents are both gone, then it takes a little getting used to. It's like a fog that you just have to work thru. So, in short, I have been working thru things and the scrappy mojo just hasn't been available to do much more than my design team stuff. And blogging, well forget that. I think the new normal is setting in, so I won't deny that I am happy about that and feeling like things are falling into their new places. Hey everyone!! 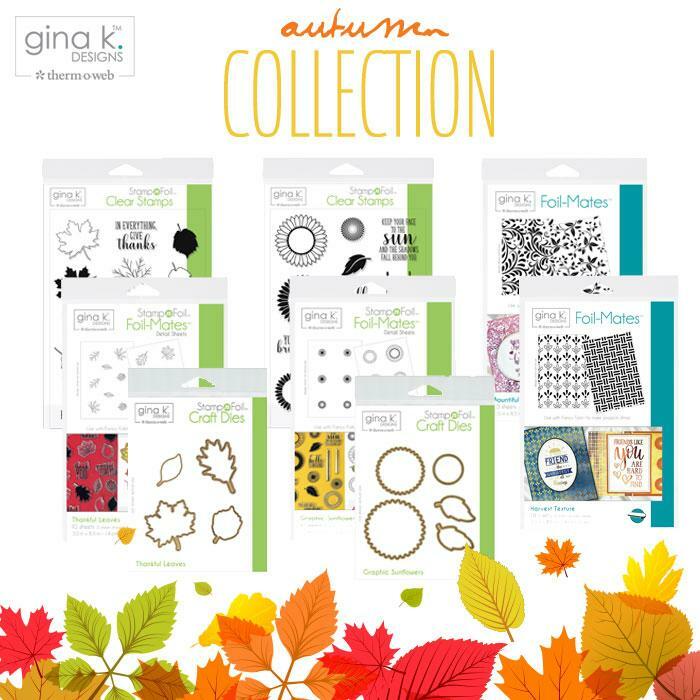 Welcome to the Fall Release Hop for Therm O Web and Gina K Designs new StampnFoil release! That is some yummy goodness right there! 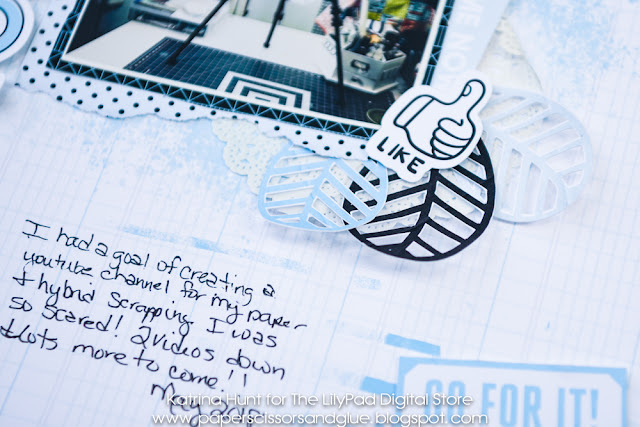 You should have arrived at my blog from Juliana Michaels, but if not, no worries!! I will have a complete blog list at then end of my post. There are prizes involved, so you are going to want to do the hop, comment and have a chance to win some goodies! I think everyone else on the hop may have made cards, but I decided I wanted to do a layout today for the release. Those sunflowers were calling my name for these pictures I have from when we went to the sunflower farm last year. It's a little north of town, so we took a road trip! Are you ready for some close ups? First up all those flowers! 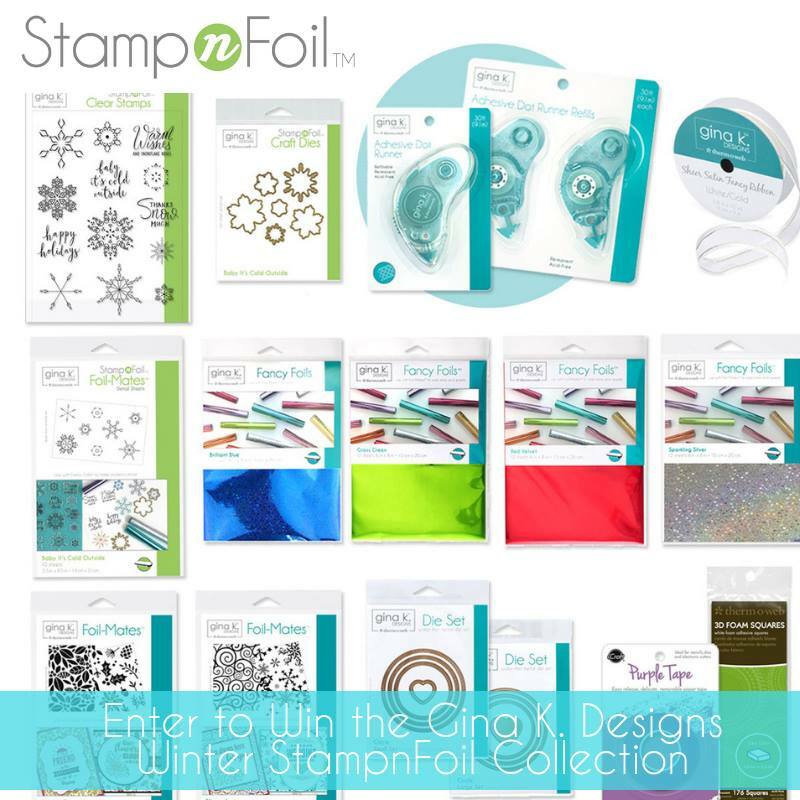 You can either stamp them, stamp and foil or just foil them. Everything is sold separately, so you can tailor the items to what you like to do or want to try! 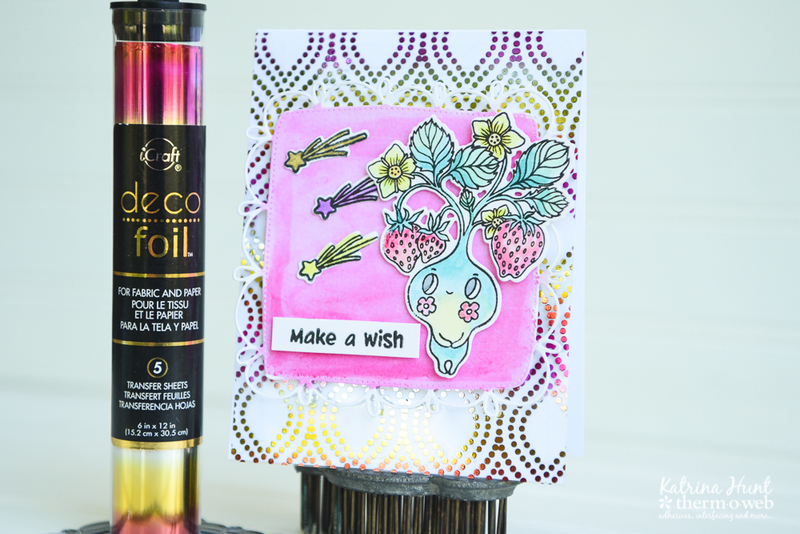 I will say, foiling with the FoilMates is super, Super, SUPER easy and a great way to try foiling. 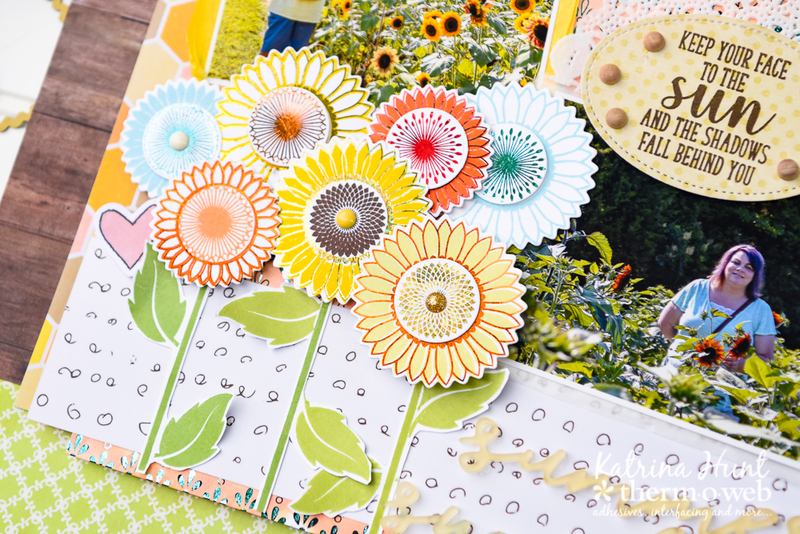 If you look closely, the center of the solid yellow sunflower is stamped in brown ink and the teal flowers outsides are just stamped and not foiled. 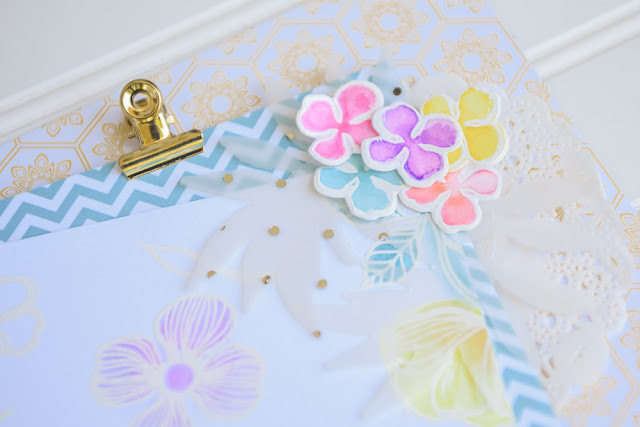 The rest of the flowers are a combo of foiling and stamping. They all look good either way! And I tried masking for the first time on those stems and leaves. I was excited how they turned out! 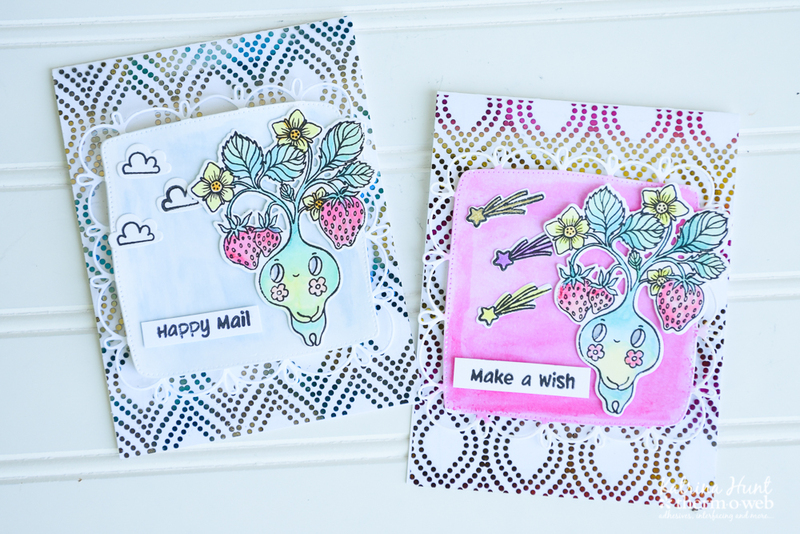 Next up, I taped two of the patterned FoilMates from the release together using the Purple Tape from ThermOWeb on the back, to make a bigger sheet of patterned paper. I used some water and Gina K ink to do a light wash of a couple of colors over the sheet. I ran the sheet thru the laminator after it dried to flatten the warping some. Then I foiled in in the turquoise color that you can see. If you want to try this for layouts or cards, just be careful to not use a lot of water! I die cut the oval from the Large Oval set of Gina K dies and then stamped the sentiment from the stamp set int he middle of it. I felt like there needed to be something in that area, and that was the option I came up with! Now, for the rest of the hop information! There are lots of chances to comment to win so follow closely!!! Comment on all the blogs on the hop! There will be a random blog selected for a winner and then a random comment from all the blogs. SO TWO chances to win there just by hopping and commenting. You can win either the Graphic Sunflowers OR Thankful Leaves. 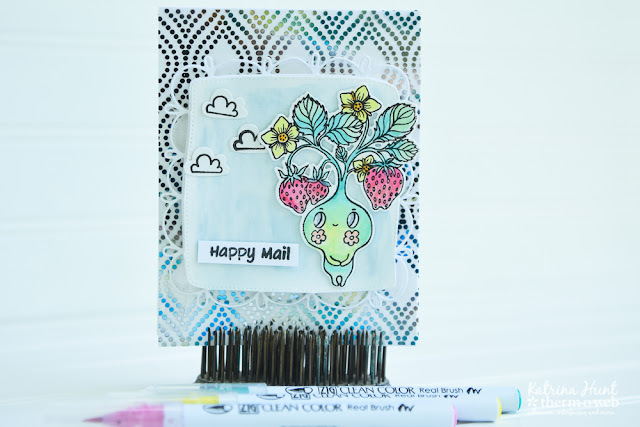 PLUS, Therm O Web will include adhesives, 3 packs of cardstock and 3 packs of the Fancy Foils in Grass Green, Sweet Mango and Wild Dandelion! These are valued at over $100.00 each! 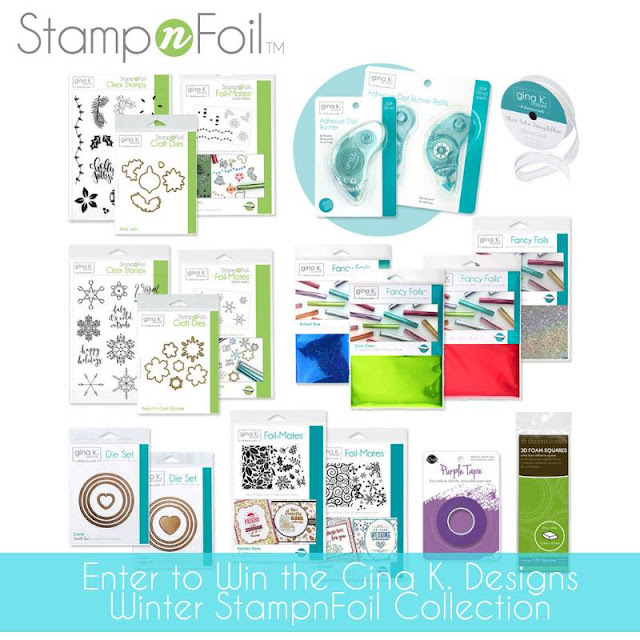 When you comment on the Therm O Web Blog you will be entered to win the ENTIRE RELEASE! Also, check out Facebook, Instagram and YouTube for more chances to win. Be sure to follow, like, and subscribe or additional chances. Now, a list for the hop will help your chance tremendously I think!!! Also Gina K Designs will be having there own party and you can find that HERE. Alright, don't forget to leave a comment for a chance to win!!! And thanks for stopping by today! 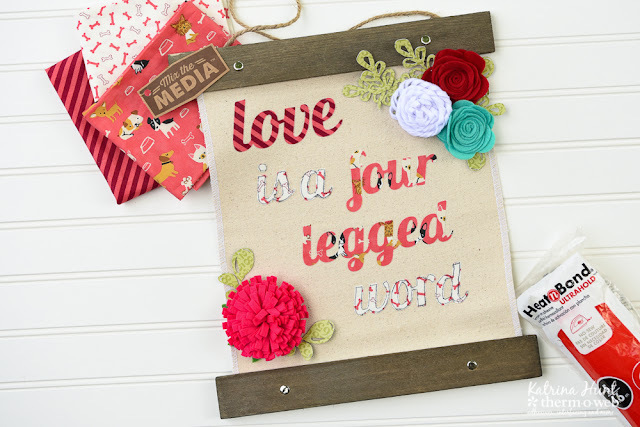 Hope you have a wonderful week full of fun, laughter and crafting! Hey there!!! 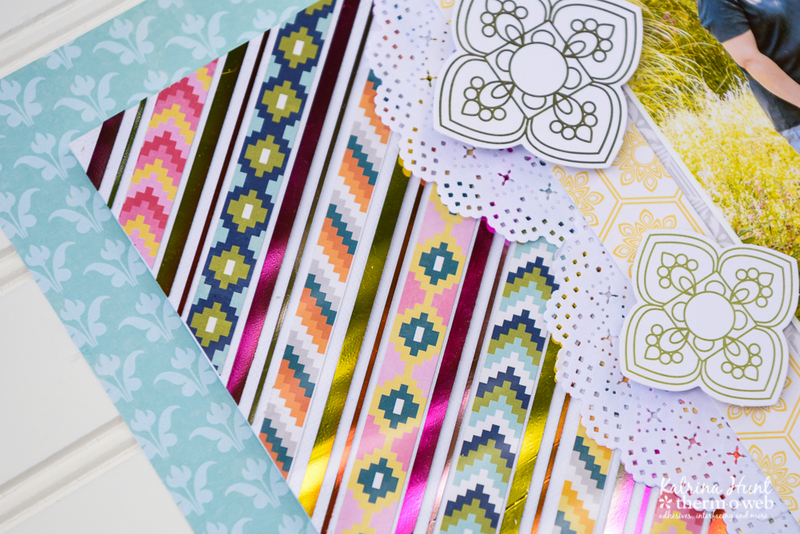 Therm O Web has teamed up with Waffle Flower Crafts this week to mix things up a bit. I am MORE than a little excited, since Waffle Flower has become a new obsession of mine! They have some of the cutest stamp stuff around and I cannot get enough of it! I created a layout and a couple of cards. ALSO, head over to the Therm O Web blog HERE and get in on the giveaway!!!! Here's the layout I made. 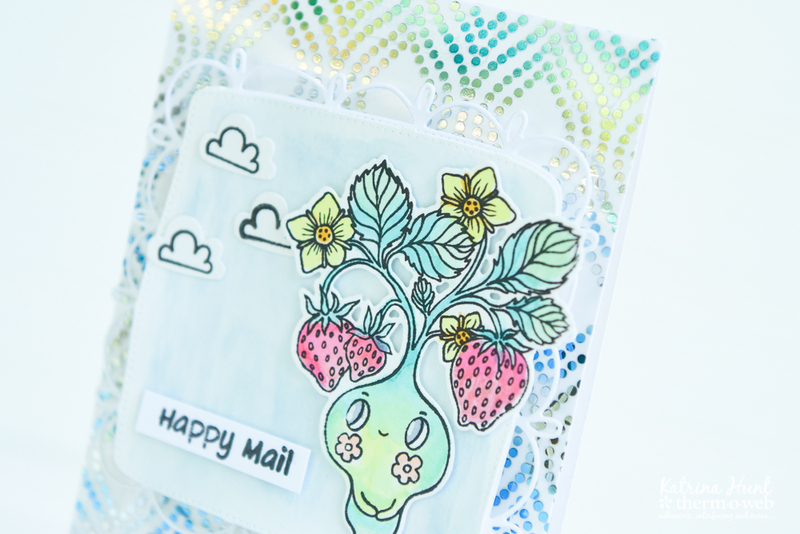 I stamped and heat embossed in white over some Canson Mixed Media paper. If I do this again, I will use the Canson Bristol paper, it's a little thicker and I liked how I could blend colors on it. I wanted a light, soft, colorful look to this and I think I got it! These pics were taken at the last vet visit for Ella. It's a monthly visit now for cancer checkup and to see how she is doing. She is still in remission, so YAY!!! The cards are basically the same design concept, except the sentiment on them, but I have a video on how I put them together and how I colored them on the Therm O Web YouTube channel! You can find the video HERE. 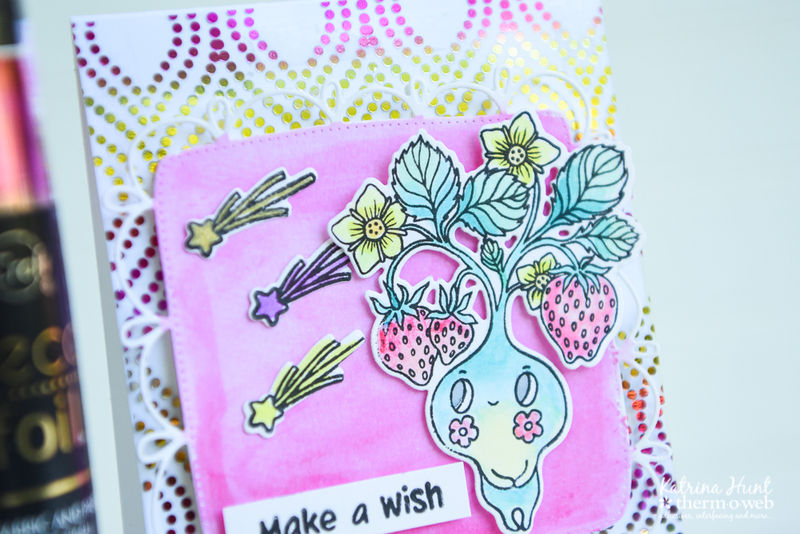 These little garden sprites are so darn cute, I just want to keep coloring them!!! And here is a list of the markers I used for each section. In the video, you can see what order I colored in and how I did the blending. Thanks for coming by today! 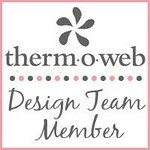 And make sure to head to Therm O Web's blog for the giveaway!! You know that last post about how I was excited that I had an extra long weekend? Well, it turned into a day longer weekend, because I ended up sick! What the heck?! It started on Friday, just being kind of blah. I couldn't sleep well that night and then Saturday I felt horrible off and on all day. By Saturday night my throat was so sore, I was whining! Sunday, I started coughing and then slept most of the day Sunday, not to mention a fever. Monday I just laid around and then Tuesday I called in because I still didn't feel good and my head hurt like someone had smacked me with a hammer. I laid around all day, until this evening when I made myself get up and at least pay the bills! But after all that, I do have a layout to share. This was on the Lilypad blog yesterday, so I thought I would share it here today. I asked the hive of creative minds what kit they would like to see done in hybrid and they picked a kit I had been eyeing anyway!! 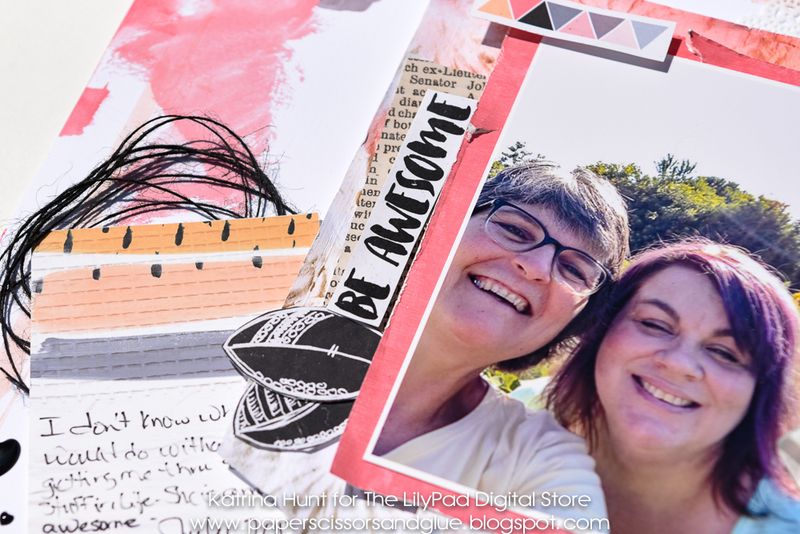 Supplies: Digital Kit-Just Jaime Like a Boss Storyteller May 2018 Add On; Adhesive-Therm O Web; Silhouette Cameo with print and cut; Paper-Red River Linen; Doily-unknown; Tiny Attacher. This definitely is NOT my usually color scheme, but I LOVE the look of this kit and everything about it! And all that that paint, splatter and fun stuff! It's so much easier for me to do it in digital! LOL I just did all of it before I printed out my page. Trust me, I fussed with it a lot in Photoshop before I got it to look the way I wanted! Have a great day! 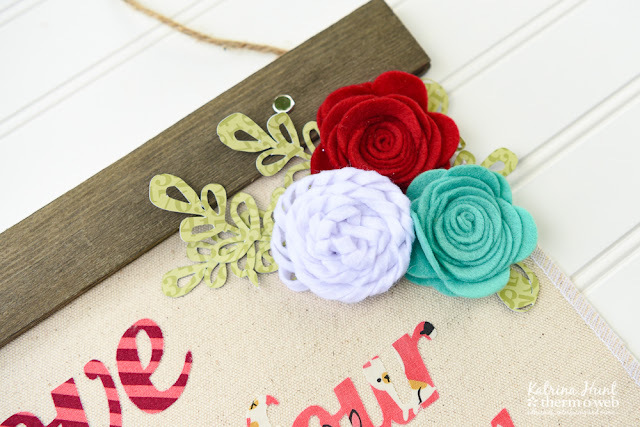 I will be back tomorrow with a post for Therm O Web and one of my new favorites-Waffle Flower Crafts! Hey scrappy peeps!! It's Wednesday and I am so not excited that it's a long weekend. HA! Yep, and I am taking Friday off to make it even longer! I thought I would share my projects that I did for the Therm O Web/Jillibean Soup swap from a couple of weeks ago. I was sent the Bohemian Brew collection and some Mix the Media products to work with. First up the layout I created. I seem to be on a "square in a square" kick after looking at my last few projects! But that's ok, I can mix it up now that I have noticed it! 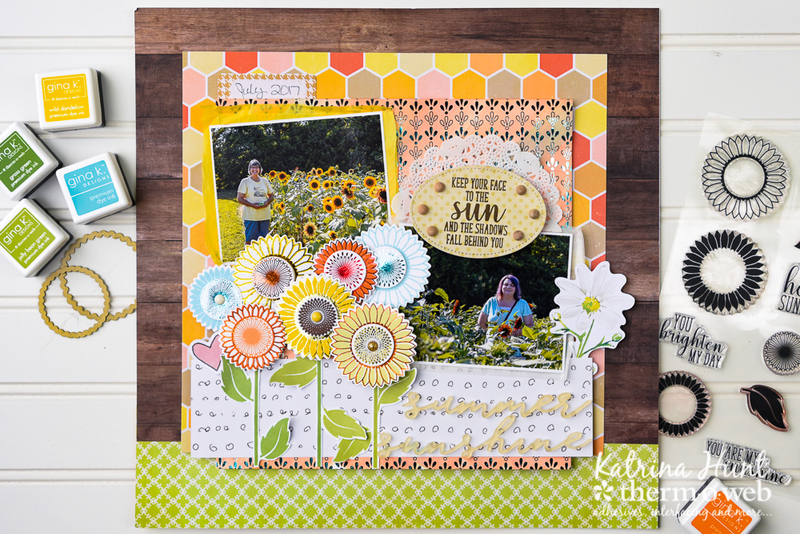 To see step out photos and how I put this layout together, visit my post on the Therm O Web blog HERE. Then you know me, I love to have fun with my titles. Doesn't matter if it's a play on words, or if it's just the arrangement on the page! I wrapped some twine thru this one! Then I had received a hanging canvas to work with. So I took the Woof, Woof, Meow fabric collection from Moda that I had received awhile back and used that to make my canvas. BTW, this is a NO SEW project! Supplies: Hanging Canvas, Felt Flowers, Pattern Paper-Jillibean Soup; Adhesives-Therm O Web; Fabric-Moda; Silhouette Cameo with cutting file; Sharpie Pen; Font-Lobster. 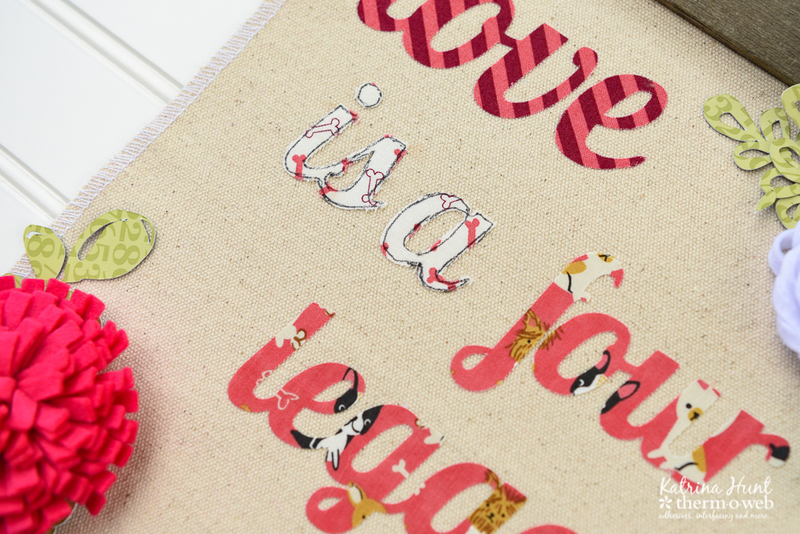 I used my Cameo to cut the letters out of the fabric. After I got them ironed on, I wanted the white letters to stand out more. So, Sharpie pen to the rescue! It works on layouts, so why not fabric?!! Shhh...I may have a stockpile of those felt flowers!! LOL I added some pattern paper vines, since some of the flowers don't come with leaves. That's all from me today!! I probably won't be back until next week. But then again, I may surprise you! Have a great Wednesday!! 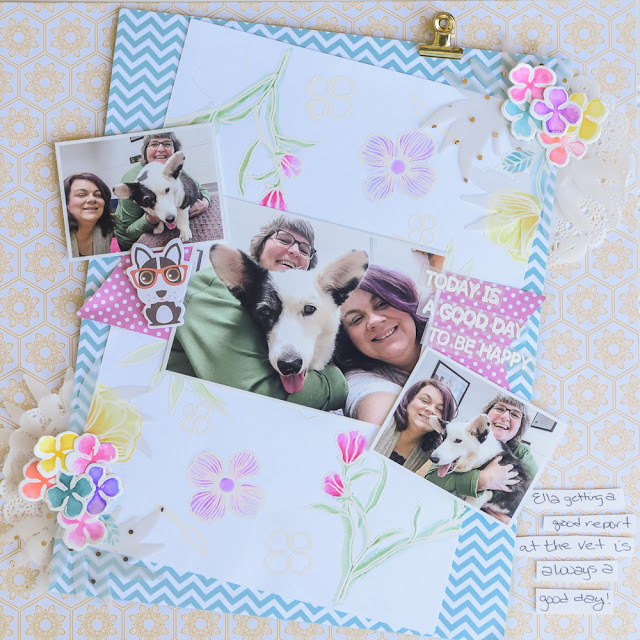 Toy Lover-Scrapping With Liz Template and Scrapping Our Stash Blog Hop.